Here are the posts for our No Regrets Parenting installment of the PAIL Book Club! Feel free to link to your post about the book in the comments and we’ll get you added to the main post listing here. Join the discussion by commenting on everyone’s posts! What, if anything, did you find particularly useful about this book? How did this book influence how you think about parenting or how you approach busyness? What parts of this book you do disagree with and why? The author keeps talking about time, time time with your kids. I know a lot of us at PAIL have young toddlers, and I’m wondering what others do with their kids in this age range. Sometimes when I have the whole weekend, at some point I feel like I run out of ways to keep everyone entertained. What kinds of things do people do to “double dip” as is discussed in this book? Do you have child activity limits or do you let your child sign up for everything like the “potpourri” parent described? If your kid(s) is(are) young, what are your plans? How do you make time for yourself if you are focusing on spending time with your children and keeping up a demanding career like the author describes? Frequently people tell parents to “enjoy every minute” while their kids are little, and at times this book has that sort of feeling. What do you think about this advice and how can you make it practical as a part of your life? How do you keep track of your child’s activities? Do you find it helpful or hard to see what you might be missing? PAIL book club vol. 5: discussion questions! Yes, I am fond of exclamation points. Here are the questions for discussing No Regrets Parenting. The deadline for posts is next Wednesday the 24th so there’s still plenty of time to join in if you are interested! We are extending the deadline to submit your questions until next Wednesday the 17th. Then the questions will be posted on the 18th. If you were thinking, “But I don’t have time to read that book!” you are wrong. You now have MORE time to read it if you want. It’s a fast read with very short chapters so you can just read the parts that relate to you. This also means the deadline for submitting posts for listing on the PAIL main page will the be 24th and the list of posts will go up on the 25th. 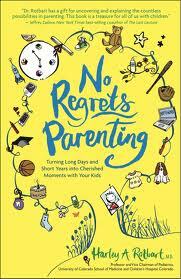 I hope you join us in reading No Regrets Parenting if it suits you!